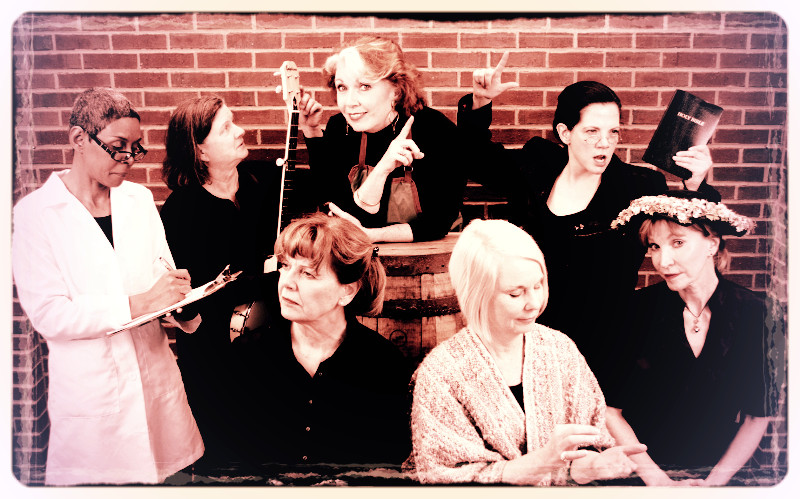 Hazel Bartlett, Kim Butterweck, Kate Larken, Gilmer McCormick, Susan McNeese Lynch, Kim Butterweck, Kate Scinta and Diane Stretz-Thurmond in Bourbon Babes of the Bluegrass. 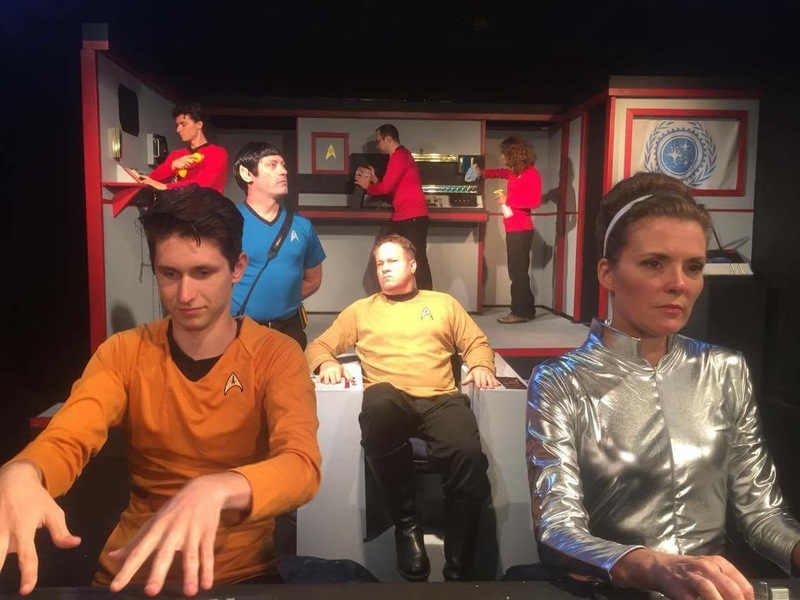 Photo courtesy of Eve Theatre Company. Entire contents copyright ©2016 by Annette Skaggs. All rights reserved. If you have any doubt that it has been women who have actually shaped how bourbon has become the global sensation that it is now, you should check out Eve Theater’s latest endeavor, Bourbon Babes of the Bluegrass, being produced at the Frazier History Museum, appropriately enough, in the Brown-Forman Theater. Seven ladies of renown in the Bourbon World sit onstage around half of a bourbon barrel, introducing themselves to the audience with a little snippet about their lives, which will later be included in their respective monologues. 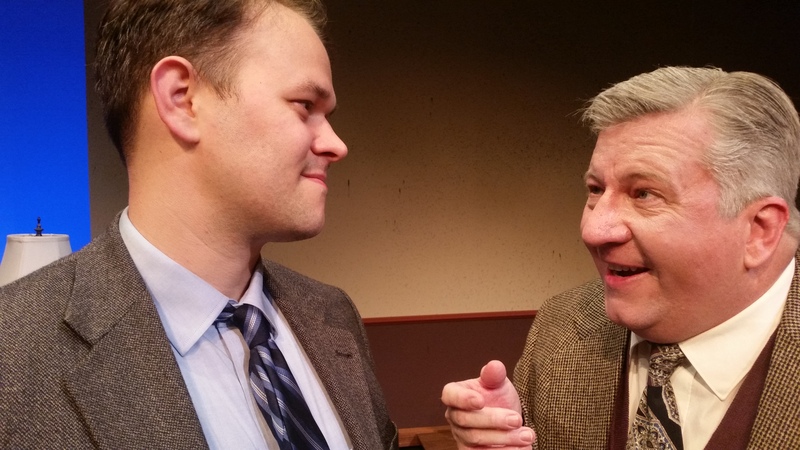 I applaud Susan McNeese Lynch (who also plays Mary Myers Beam) for truly doing her research in writing this play, and I say that as a person who has studied bourbon history herself. The seven women portrayed are storied ladies of Bourbon history, including the infamous Carrie Nation (Kim Butterweck) and Bootlegger Maggie Baily. Director Kate Larken plays the deep country lady of notoriety, Baily, with a fun and entertaining Southern drawl while strumming some mean banjo and harmonica as musical interludes between scenes. The whole of the play does not present the ladies in chronological order, which is fine, but I personally would not have positioned Ms. Butterweck’s Carrie Nation at the end of the evening, perhaps instead choosing Ms. Lynch’s Mary Myers Beam, whose family has been in and around bourbon and distilling spirits for over 200 years. Kate Scinta’s Catherine Spears Frye Carpenter is the first known person to have written the winning recipe for sour mash that is used to this day, and she shines as the young pioneer woman who had buried her husbands, but still maintained the businesses; her eyes shine when talking about her recipe. Diane Stretz-Thurmond’s Mary Murphy Dowling was fetching as she talked about outsmarting the Feds by running away to Mexico, where she thrived and survived. Gilmer McCormick absolutely embraced what I had often thought was the essence of Marge Samuels: pragmatic and smart. As it pertains to Ms. Butterweck’s interpretation of Carrie Nation, I believe it may be a case of less is more. Her voice is a powerful instrument, but with such a small venue, it started to sound like yelling. Don’t get me wrong, when she talked about Hatchetizing and preaching the Tolerance Movement, she was right to sound as if she was evangelizing to a throng of thousands. The opposite held for Hazel Bartlett’s Elmer Lucille Allen. I had the great fortune of meeting Ms. Allen many years ago and for the most part Ms. Bartlett captured her brilliance, but I was not convinced of her assuredness and confidence. Perhaps it was opening night jitters. Throughout the evening the ladies would offer mixers in which they would talk about the invention of the Cocktail, or how to make the perfect Old Fashioned, Mint Julep, or Ms. Lynch’s funny tutorial on the making of the Holiday Fruitcake. All in all, if you enjoy a little fun while learning about some of the most famous “gals who guzzle” then head to the Frazier Museum for this limited event. Cheers! !